This week I got to catch a glimpse of Uncharted 2: Among Thieves at the Naughty Dog studios. (They had an adorable pink nosed poodle mascot named Trumpet that greeted me at the front door.) We sat down with the Naughty dog team as they showed us what new adventures Nathan Drake will experience on his journey to finding the truth behind the lost fleet of Marco Polo and the legendary Himalayan valley of Shambhala. The beginning of the presentation started with Nathan Drake’s character. The team went into great detail to explain who Drake is and how he’s a flawed, fallible hero. He’s a very complex character with a darker side to his personality for he’s in the company of thieves and always has to be on guard. More of Drake’s personal traits surface with the range and variety of characters he meets along his way. The team felt this explanation of Drake was very important so that players could connect with him. He’s not just some rough, tough, 100 pounds of armor soldier that blasts people away. The plot of Drake’s journey is actually based on the real events of Marco Polo. In 1292, Marco Polo departs China with a fleet of 14 ships and 600 passengers. Arriving at his destination 18 months later, only 18 passengers and one ship remained. The explanation for the missing ships, people or treasures was never revealed. Hoping to find these fortunes, Drake attempts to seek out these fleets, only to find Marco Polo had an even bigger secret. The Cintmani Stone, a raw sapphire “wish granting” jewel of Buddhist mythology. 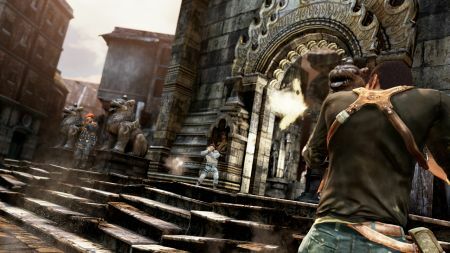 Our demo began with Drake in a war torn city in Nepal. He is trying to rendezvous with his partner, and romantic interest, Chloe Frazer who is somewhere within the city already. What Drake hadn’t realized was that the city had been evacuated and is surrounded by soldiers. He tries to sneak in as a member as press but doesn’t quite pull it off the way he’d like. The soldiers get suspicious, approach with guns and he makes a run for it. 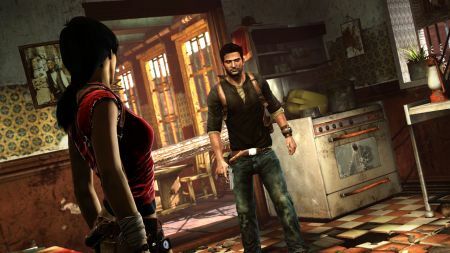 Naughty Dog is allowing you to play as aggressive as you want or as stealthy as you want in its open design. We were shown both ways and the stealth seemed to be the better choice for our player. There will be “traversal gunplay” letting you shoot from any position you are in, including while climbing and hanging. There is the introduction of traversal and free-climbing mechanics that make for smooth navigation and jumping from pole to wall to creaky loose signs off the sides of buildings. The extreme detail to the environment was immaculate. From the designs in the carpeting, to the colorful masks on walls that make you want to have one in your home, to the scenery itself, nothing was left out. 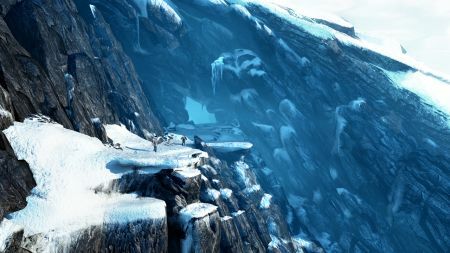 We were told that some of the artists even traveled to exotic cities for the inspiration to make the land look and feel as genuine as possible. I think they did a damn good job.